My wife and I recently traveled with our daughter to Seattle as she was invited to sing the national anthem for the Seattle Seahawks game. Jaci has been blessed throughout her career and asked to do the same for the Tennessee Titans, the Florida Marlins, the MLS All Star Soccer Game, the Texans, the San Antonio Spurs, the Minnesota Timberwolves and several others. It is amazing how much emphasis the sport franchises put on who they choose to sing the 3 minute song at every game. The Seahawks organization was extremely hospitable to our family. Four adults and two babies is quite the undertaking in regards to travel, hotel etc. They outfitted us with a suite to watch the game, official jerseys, food and travel. 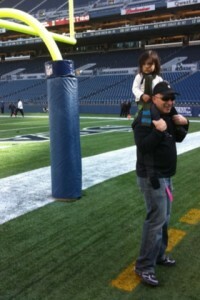 It was especially exciting for our grandsons who got to hang out on an NFL field before the age of 2! So that brings forth the question “Why the big hoopla about who sings the 3 minute song?” Well first of all, The Star Spangled Banner is America’s National Anthem which makes the most popular song in the United States of America. The song’s popularity makes it tough to flawlessly sing it in front of 50k-100k Americans who should know every word. We have all seen instances where singers slaughter the National Anthem with the biggest memory given us by Roseanne Barr. And then there was Carl Lewis who recently started in a key much higher than he should have. (I really did feel for him!) I must say that Jaci Velasquez does the best and most consistent job that I have seen from anyone! Hopefully it will lead to more family trips to great sporting events. We have our fingers crossed for a Superbowl!